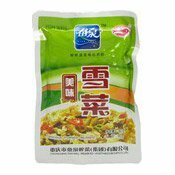 The product has special flavour and tastes fresh crisp and delicious. It tastes very good and increases your appetite. It can be eaten directly upon opening the bag. Ingredients: Potherb Mustard, Rapeseed Oil, Salt, Sugar, Spices (Aniseed, Fennel, Dried Ginger, Radix Angelicae, Licorice, Pepper), Flavour Enhancers (E621, E635), Acidity Regulator (E330).